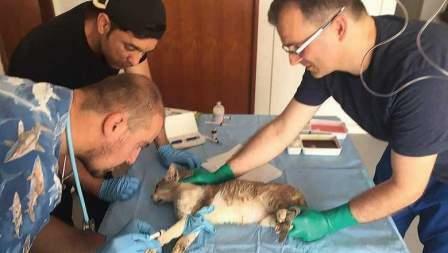 The UAE is looking to have its very first mobile VET clinic to help treat abandoned animals on the streets of Abu Dhabi, Khaleej Times has learned. Dr Susan Aylott, founder of Animal Welfare Abu Dhabi (AWAD), told Khaleej Times the team is working on running a mobile clinic, which will see a great decrease in the number of injured and run-over cats in the Capital. On Friday, a team from the Awas, including licensed veterinary surgeons and AWAD certified trappers, transferred equipment, traps and medical supplies to the island by boat, to set up the surgeries on a shady part of the deserted island. It goes to show how these surgeries can be successfully performed by qualified doctors despite the minimal surroundings," said Dr Aylott. In 2017, the Awad became the first organisation in the UAE to conduct a clinic field that helps care for the animals. "We tried to get the cats off the island, but we found it's too stressful for the animals to do the journey, that's why we have a series of 8-10 volunteer vets offering their time." "We are looking to set up a whole mobile clinic eventually, but in the mean time, we want to get some data to show how well the mobile clinic will work. So far, this programme has been a great success." In a matter of just two hours, the team managed to not only sterilise 14 cats on the island, but also treated them, provided medical care, fluids, antibiotics and even dental care. The team will continue the field clinic, until nearly 200 cats on the remote island are treated. "The cats were all released in the same place we picked them up from, they are all healthy now and back on the feeding station there." She added that many volunteers are eager to help treat the cats on the Island, particularly veterinary students. "They get to have hands-on experience on the work we do, which is very important for them and they enjoy it." Dr Aylott stressed that the field clinics have proven that the mobile VET clinic will be a cost effective and time efficient way of helping care for UAE's abandoned animals. She said sterilising the cats is also important for the image of the society. "Sterilised cats means they can't reproduce, which ultimately means we will have less starving kittens being run-over by vehicles." Dr Aylott is looking forward to see the UAE's first mobile VET clinic up and running. "Once we have the mobile clinic, we can drive around Abu Dhabi and strategically sterilise all the cats that we have at our feeding stations. Animal welfare will be improved and the image of the communities will be improved, because people will only see healthy cats." This will be the first of its kind in the UAE, which is spectacular." She added that the mobile clinic will also help raise awareness about animal welfare. When we are on the streets helping animals, we notice that the communities become keen to get involved, people really love the animals and they want to help, so awareness and education are vital." "We need to raise education that these cats don't pose any harm, they will be vaccinated and healthy, because of the mobile clinic." Dr Aylott stressed that many of the abandoned cats are the Arabia Mau, which are part of the country's heritage. "They are officially a recognised breed, you don't get them anywhere else in the world, because they are indigenous to the Arabian Peninsula." "We owe this to them - we have to preserve them, because they are part of the UAE's heritage."